Half-Korean-quarter-Chinese-quarter-Portuguese singer, rapper, host and entertainer. He rose to fame as a member of K-Pop boy group U-KISS, but now is working as a solo singer with "I Just" as his debut single. 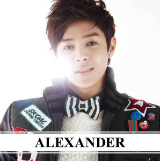 Alexander is now currently signed as a solo artist under his new agency, M Plus Entertainment, and has released his digital single, "I Just". He has appeared in stints in several radio shows and on several South Korean TV variety shows. In addition, he has also modelled for a few designers, including famous Korean fashion designer Lee Sang Bong.